By Brooke Holland, Noozhawk Staff Writer | @NoozhawkNews | February 1, 2018 | 9:06 p.m.
California’s main marketing agency will spend millions to help spread word that visitors should not cancel their traveling plans to the Santa Barbara region in the aftermath of the dual fire and flood disasters. 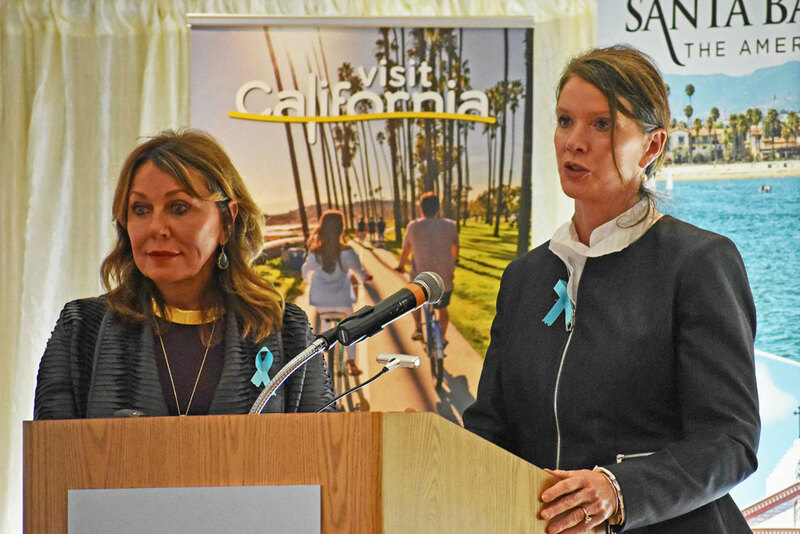 Caroline Beteta, president of Visit California, said Thursday that the nonprofit affiliated with the state's Office of Tourism launched a $2 million campaign assuring travelers that the region remains a destination and welcomes consumers to the area following December’s wildfire and the Jan. 9 mudslides. The ads aim to counter the perception that tourism halted after the damage during the Thomas Fire, which burned nearly 282,000 acres in Ventura and Santa Barbara counties, and destructive mudslides. “There is an image that is left behind, and the reach is powerful,” Beteta told some 180 Santa Barbara County tourism industry leaders at the Hyatt Centric Santa Barbara. The ads piggyback on Visit California’s marketing campaign to bring consumers back to Sonoma, Napa and Santa Rosa following the wine country’s wildfire last year. The event was sponsored by Visit Santa Barbara, the tourism marketing agency for the Santa Barbara County South Coast. Visit California and Visit Santa Barbara are working together to bring consumers to the area. According to Visit California, the nearly two-week Highway 101 closure resulted in a loss of about $13 million, or $949,000 a day, in visitor spending in Santa Barbara County. County tourism industry officials remain optimistic about promoting the area. An exact dollar amount of the loss in tourism spending has yet to be determined, but Ken Oplinger, president and CEO of the Chamber of the Santa Barbara Region, said that Visit Santa Barbara, the chamber, UC Santa Barbara’s Economic Forecast Project and Women’s Economic Ventures have partnered to perform a detailed survey of the economic impact on local businesses due to the Thomas Fire and mudslides in Montecito. The report is expected at a future date. City of Santa Barbara officials also have stepped up to help local businesses. Santa Barbara Mayor Cathy Murillo told Noozhawk Thursday that the city will be issuing a refund to 43 restaurants for outdoor dining license fees during the months of business interruption in December and January. She said businesses pay different amounts of sidewalk dining fees depending on the number of chairs placed on the public sidewalks. Murillo said each business pays $260 per month, on average. According to city Treasury Manager Julie Nemes, Santa Barbara city reported collecting about $844,000 in transient occupancy tax from hotels and short-term rentals in December, a 26.8-percent decrease from the previous year. Due to the negative financial impact of the fire and debris flow incidents to hotels, they were given the option to defer their payment without any penalty or interest until March 12 to give a more flexibility with cashflow, Murillo said. TOT is collected monthly, and the rate is 12 percent on each room stay, according to Murillo. Murillo credited Trevor Large, president of Hospitality Santa Barbara, for asking for these considerations at a business-recovery meeting convened by the Women’s Economic Ventures. “City officials agreed to extend this relief to help our businesses survive these natural disasters,” Murillo said. She noted that the city’s newsletters and other public communications have included encouragement to residents to spend their money locally, eating out, shopping or seeking entertainment. “We must support our community,” she said. “Everyone has come together to support our neighbors in Montecito, even as we survived the unhealthy air quality, the closure of Highway 101, school days lost, and the disruption to our quality of life.